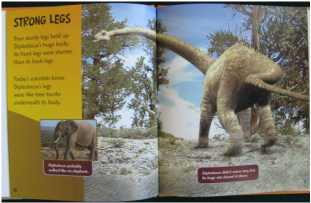 These dinosaur profiles cover key information for middle elementary readers. Vibrant images, accompanied by colorful maps, fun facts, and engaging text supported by Smithsonian experts, transports readers back in time to when these giants roamed the earth. Boom! Crack! The mighty Diplodocus thundered through the Jurassic Period. With its massive size and built-in whip for a tail, predators stayed clear. Fun facts help readers learn about one of the longest dinosaurs to walk the earth! Explore the world of the Ankylosaurus, a plant-loving dinosaur that walked this planet over 65 million years ago! From its club tail to its armored body, find out what made this ancient lizard thrive in the Cretaceous Period. Before Tyrannosaurus rex, there was the mighty Allosaurus. This carnivorous dinosaur ruled the Jurassic Period with its razor-sharp teeth and deadly claws. This book transports readers back in time to meet this terrifying meat eater. Megalosaurus was the first dinosaur ever found in fossils. The discovery of this "Great Lizard" introduced the world to prehistoric monsters that once roamed the earth. When the giant Apatosaurus walked, the ground shook. Once known as Brontosaurus, this dinosaur was one of the largest land animals on Earth. Iguanodon was a speedy dinosaur that could get moving on either two or four legs. The second dinosaur ever discovered in fossils, Iguanodon lived on every continent on the planet, except Antarctica.